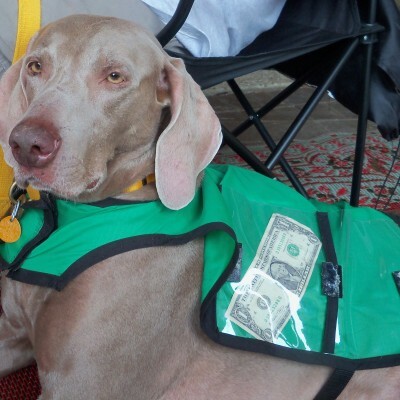 Weim Friends Rescue is an all volunteer 501 (c) (3) non-profit organization based in Cincinnati, Ohio. We rescue, rehabilitate and re-home abandoned Weimaraners. We dedicate many hours to helping the Weims that come into our program. We look forward to speaking with you about adopting one of our rescued Weimaraners! We rescue Weimaraners from local animal shelters and from local owner surrenders. From time to time, we do get puppies into rescue, but it is not consistent. We do not post puppies on our website/Petfinder page, so please submit an adoption application and specify that you are interested in a puppy and we will contact you should a puppy come into rescue. Please do not send us emails asking if we have any puppies as we are an all volunteer organization and do not have the ability to respond to these requests. By submitting an adoption application, we will recognize your commitment to the adoption process. If you are adamant about getting a puppy in a timely manner, we encourage you to contact the Weimaraner Club of America (WCA) and work directly with their breeder referral contact. The WCA breeders follow strict guidelines and are committed to the Weimaraner breed standards. Please do not buy a puppy from a backyard breeder or from a pet store. There are too many purebred and mixed-breed dogs sitting in a shelter on borrowed time. Please visit our Petfinder page for up-to-date profiles of adoptable Weimaraners in our program. We are often asked about why purebred Weimaraners need to be rescued. Sadly, many people fall in love with a Weimaraner puppy, but are not prepared or committed to the exercise regimen necessary for an adult Weimaraner. Many of the Weims that come into foster care have been surrendered by their owner who is no longer able to care for the dog whether it is due to financial or personal circumstances. Some are relinquished to a shelter or picked up as strays and the owner does not reclaim the dog. Few come from abusive situations where the dog may need special care prior to adoption. All of the Weims have big hearts and are hoping to find a permanent home that will love them through their senior years. All of our Weims live with a foster home who become the experts on what family will be the best match for their foster Weim. We do not have a shelter facility. Are you ready to Adopt a Weim? Phone Interview: Once we receive your completed adoption application and any rental agreements & roommate consent(s) (if applicable), then a volunteer will call you to discuss your application and Weimaraners that may be a good match for your family. Reference Checks: We will call your references, so please be sure to call your Vet (if applicable) to give them the approval to release vet record information to the rescue. If you have owned pets in the past or currently have pets, we will verify that all pets were kept up-to-date on vaccinations and heartworm prevention. Note: most of the delays occur when we are not able to reach your personal references and vet offices. Please give them notice that we will be calling. Home Visit: A volunteer will call you to schedule a home visit. We ask that all members living in the home be present for the visit as it is important that all family members are committed to adopting a rescued Weimaraner. Weim Visit: Once your application is approved (see the steps above), then you will be ready to speak with the foster homes about the rescued Weimaraners that you are interested in and schedule a visit. You will need to travel to the foster homes to meet the dogs. We ask that you bring your entire family, including any dogs, to meet the foster dog to ensure all parties will get along. We do NOT hold or ship dogs. We place the dogs with the family we feel is the best match for the dog. If you don’t feel a connection with the dog, then we encourage you to be patient until the right one comes along. Adoption Contract: Once you and the foster home have agreed to the adoption, you will be asked to sign an adoption agreement contract and pay the adoption fee. The foster home has the final say on where the rescued Weimaraner is placed. We do not hold any dogs, nor do we ship any dogs. Please be committed to the adoption, as we do not give refunds on the adoption fees should you decide later that you are not able to keep the Weimaraner. If you are not able to keep the Weimaraner you MUST return the Weimaraner back to the rescue. Adoption Fees: All rescued Weimaraners will be checked by a veterinarian upon entering the rescue, brought up-to-date on vaccinations, heartworm checked and on heartworm prevention, on flea prevention (in season), microchipped and spayed/neutered (age dependent). You will be given an adoption packet which will include the Weimaraner’s medical records, collar/tags/leash and specific information on the Weimaraner: dog food schedule, exercise schedule, etc. Adoption fees are listed on our adoption application and in a dog’s Petfinder profile. All of the monies we receive go directly back into the rescue to care for the Weims in our rescue program. Thank you for considering adding a rescued Weimaraner into your home. We look forward to speaking with you!